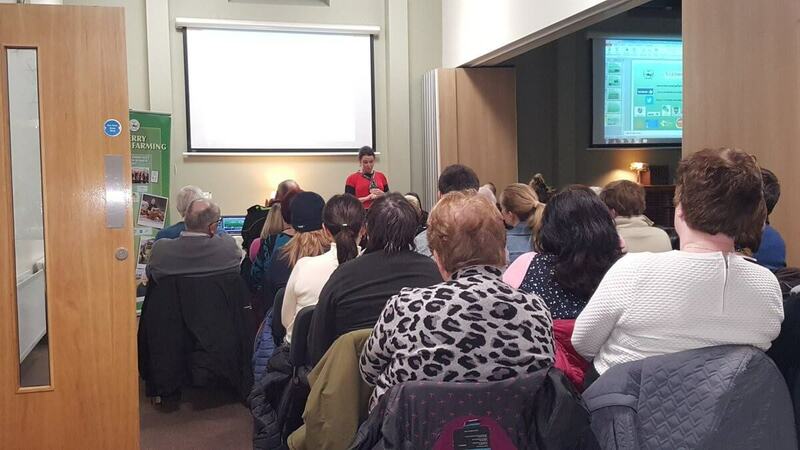 Kerry Social Farming held its Annual Meeting at Listowel Family Resource Centre on Tuesday 22nd of January 2019. Over 70 people from all over the county attended including social farming participants and their families, host farmers, representatives from partner service providers and farmers interested in becoming involved with the project. Guest speaker Councillor Aoife Thornton spoke passionately about her own personal experiences of the benefits of social farming. Irene Kavanagh, Kerry Social Farming Facilitator gave a comprehensive review of activities during 2018 highlighting the continued expansion of the project. There are now to 18 host farms with 33 participants all over Kerry being supported. Host farmers and participants spoke about the positive effects of social farming and of lasting friendships and support that it has brought to their lives. The evening was rounded off by a presentation to each host farmer of a specially commissioned framed aerial photo of their farm. •	Cllr Aoife Thornton Chair of Listowel Municipal District. •	Social Farming Participants Bronagh Enright and Mags O’Donoghue. •	George Kelly, Chair of Kerry Social Farming. •	John Stack Chair of NEWKD. •	Michelle Angland of St John of God, Kerry Services. •	Paul Geraghty of DRCD. 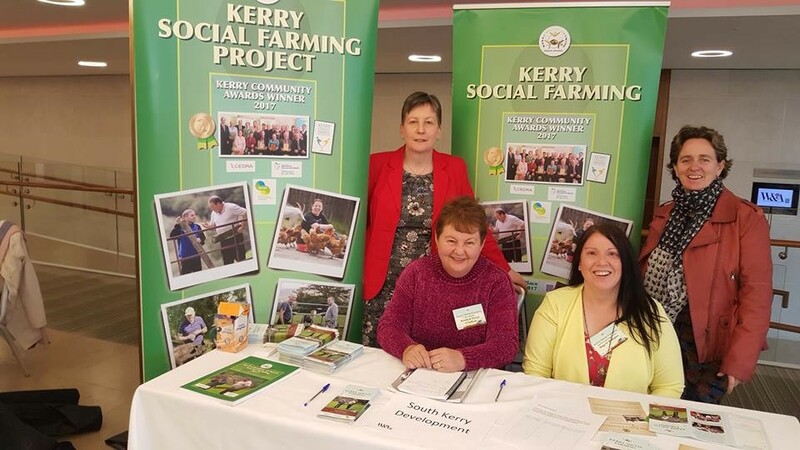 Kerry Social Farming were represented at Women and Agriculture Conference 2018 hosted by Irish Country Living (Farmers Journal) at the Europe Hotel, Killarney. This is the first time the project had a presence at this high profile event which attracted over 650 women from across Ireland. This proved to be an invaluable networking event and a great way of publicising the project to a new audience of women farmers, rural businesswomen from a variety of sectors, community leaders and entrepreneurs. Host farmers Maura Sheehy, Breda O’Sullivan and Helen O’Mahony, participants Mags O’Donoghue and Breeda O’Sullivan, Angie Kissane (SJOG), Gerry Smith (SJOG), and KSF administrator Julie Brosnan helped out on the day, meeting and chatting with those attending and handing our information leaflets about social farming. Kerry Social Farming host farmers and participants attended the recent National Ploughing Championships in Tullamore. We had plenty of visitors to our stand and lots of networking with those interested in finding out more about social farming. Unfortunately our presence was cut short by damage caused by Storm Ali on Wednesday 19	th September. 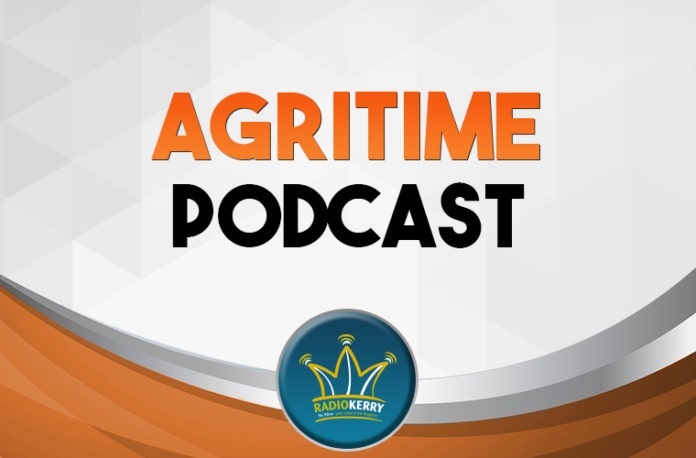 Host farmer Eamon Horgan spoke to Aisling O’Brien on Radio Kerry’s Agritime programme on September 20	th about the eventful trip to the Ploughing. Kerry Social Farming showcases its work at recent Project Ireland 2040: Strengthening Rural Communities & Economies Event in Westport Co. Mayo. Kerry Social Farming took a leading part in Project Ireland 2040: Strengthening Rural Communities and Economies held at Town Hall Theatre, Westport on July 13th. KSF Facilitator Irene Kavanagh participated in a panel discussion on ‘Creating Stronger Rural Economies and Communities’ , sharing the stage with An Taoiseach Leo Varadker, Minister for Rural and Community Development Michael Ring, Dr. Maura Farrell (Rural Network), and Anne Marie Delaney. The panel was chaired by Mary Kennedy from RTE’S Nationwide programme. Delegates viewed a specially prepared video on Kerry Social Farming (see above) and heard about the positive impact this unique project is having for participants, families, farmers and communities all across Kerry. There was plenty of time for networking and Social farming participant Earl Leahy and Host farmer Ger O’Sullivan took the opportunity to chat to Taoiseach Leo Varadkar about social farming and the importance of supporting sustainable rural communities. Kerry Social Farming Project are delighted to be represented on a panel on “Creating Stronger Rural Economies and Communities”. Irene Kavanagh, Kerry Social Farming Facilitator, will represent our project on the panel. The panel discussion is being held as part of the Rural Sectoral Event for Project Ireland 2040 hosted by The Department of Rural and Community Development and The Department of Agriculture, Food and Marine Project Ireland 2040 and is held on Friday 13th July, Town Hall Theatre, Westport. Such has been the success of the Kerry Social Farming project in South Kerry it has now expanded county-wide with five new farmers in North Kerry coming on board with the unique project. Kerry Social Farming, is a project that facilitates adults with disabilities to visit and help out regularly on farms in Kerry. The initiative allows the participants to work with animals on the farm as well as learning farm skills and life skills. It also helps them become part of the local community. On the other side of the coin it helps local farmers develop new relationships and to have assistance and company on their farms. The unique project has received nation-wide and European praise, and was the winner of the 2017 Kerry Community Awards as well as being honoured at the National Pride of Place Awards. The Social Farming initiative works in co-operation with many agencies in the county including Kerry County Council, disability service providers, the HSE and NEWKD, amongst others. It is also supported through the Rural Social Scheme and the TÚS programme. Kerry Social Farming has gone county-wide with five farms in North Kerry opening their doors for young adults with disabilities. These are in Tralee, Ballybunion, Ballyduff and Castleisland. There are 11 farms participating in south Kerry. On Thursday last a farm walk took place in the farm of Helen O'Mahony in Castleisland to showcase the project and the benefits for all those involved. Among those in attendance were participants and farmers from South Kerry as well as new farmers in north Kerry. Chairman of the board of NEWKD John Stack, who is also a farmer, and IFA Munster representative John Coughlan also attended. A presentation was also made by Belinda Gascoigne from UCC/Skellig CRI Cahersiveen on a new Social Farming training course currently being developed. "The idea was to promote the project in North Kerry. What is unique about this project is that it is voluntary and unique," says Kerry Social Farming Facilitator Irene Kavanagh. Currently the project is funded by the Department of Agriculture but a long-term funding solution is key to the future of social farming and to its future across the county. Aisling O’Brien hears about boosts for both Farm Assist payments and the Rural Social Scheme (RSS). She checks in with Kerry Social Farming Project and brings you prices from marts and factories with Tomas Burke. There’s also a focus on preparing cattle for the upcoming breeding season and she hears from a writer in search of interesting farm trees. Capturing individuality in a collective effort. It was a day of celebration for the Kerry Social Farming Project as participants reflected on a fifth year of success at their annual meeting in The Brehon, Killarney, last Wednesday. Winners of last year's Kerry Community Awards, the project has been running since 2013 and has a massively positive effect on the people involved. The voluntary project aims to provide opportunities for people with disabilities to learn new skills on farms around south Kerry. It gives an opportunity for people with disabilities to work on local farms for a few hours a week to help develop crucial skills. "They become part of the 'Farm Family' and the farmers working with them are great help," says Irene Kavanagh of The Kerry Social Farming Project. Irene has praise for everyone involved in the project and says that Wednesday's meeting was an opportunity to discuss the huge strides the project has witnessed, particularly within the last year. 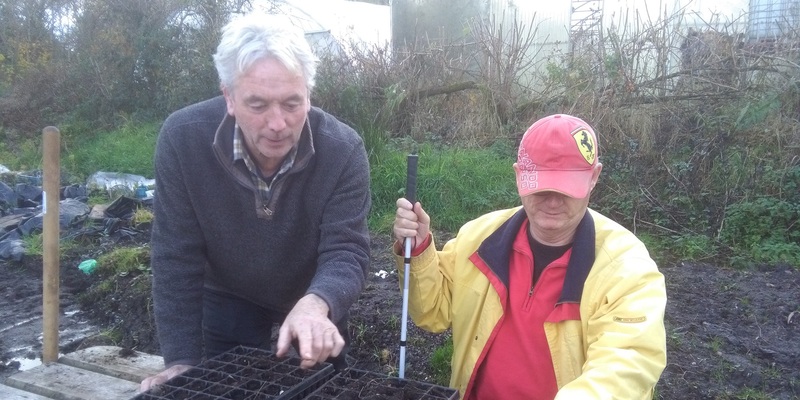 "We currently cater to over 36 people with disabilities and there are 13 farms and two community gardens that volunteer within the project," Irene told The Kerryman. These farmers and all of their families were present on Wednesday to see just how much the project has helped change lives. The event was also a chance to explain how beneficial the project is and how crucial it is that people with disabilities all over Kerry should be able to access these opportunities. Junior Minister Brendan Griffin was present on the evening to lend his support and to talk to those gathered about how it needs to continue and expand. "The best part of the night was definitely when a framed photo of people out on the farm was presented to the project," says Irene, adding: "It was just very sweet and really represented what we are trying to achieve here". "The Brehon was great and despite the bad weather we had a great turnout." Irene said that the volunteers got positive feedback from the farmers involved and added that the next chapter for the project will be to expand into North Kerry. 3 December 2017 2017 IPB Pride of Place Winners Announced. Kerry takes top spot in two of the main competition categories. 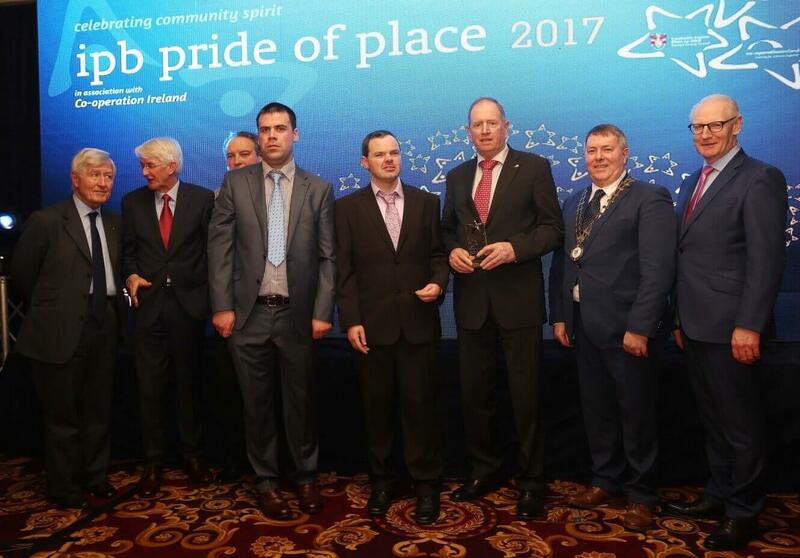 The winners of the IPB Pride of Place Awards in association with Co-operation Ireland were announced last night at a gala awards ceremony in Letterkenny. The awards acknowledge the achievements and the invaluable work undertaken by volunteers and those involved in local community development. Glenbeigh in Kerry achieved the runner up position in category one, which is for villages with a population of less than 300 people. Kerry Social Farming Project also took the runner up spot in category eight, Community Reaching Out Initiative. During the ceremony 49 awards were announced in the main competition, the cities competition and special awards, ranging from groups supporting small rural communities to those involved in large inner city housing estates. Donegal County Council hosted the evening and celebrated Irish musicians Donal Lunney and Paddy Glackin entertained the audience before the winners were announced. RTE presenter Aengus MacGrianna was MC for the ceremony, which was attended by over 800 people. Sponsored by IPB Insurance, the Pride of Place competition was initiated 15 years ago through a Co-operation Ireland programme to acknowledge the invaluable work undertaken by communities and groups across the island of Ireland. It has grown into the largest competition recognising community development achievements. The winners were presented with their awards by Minister Joe McHugh TD, Government Chief Whip & Minister of State for Gaeilge, An Ghaeltacht and the Islands, Cathaoirleach of Donegal County Council, Cllr Gerry McMonagle, Dr Christopher Moran, Chairman Co-operation Ireland, Michael McGreal, Vice Chair IPB Insurance and Tom Dowling, Chairperson, Pride of Place Committee. Tom Dowling, Chairperson of IPB Pride of Place Competition said "This unique competition is about showing respect and inclusion for every sector in our communities, young, old, rich or poor and creating communities to which the people are proud to say they belong". He added that he was delighted that this year's gala ceremony was being held in Donegal. Peter Sheridan, Chief Executive of Co-operation Ireland said "The Pride of Place Awards ceremony is an ideal opportunity for organisations to come together and learn from each other. This will be important as we prepare for the inevitable changes Brexit will bring to the island of Ireland. This evening, we have witnessed some of the finest examples of people working together to create a positive future and we all must continue to build on this so that Irish society as a whole can benefit. I congratulate everyone who was nominated but I extend special congratulations to those groups who were triumphant this evening". Michael Garvey, Chief Executive Officer of title sponsor IPB Insurance, reaffirmed his company's support for the competition, he said "The IPB Pride of Place awards is an ideal platform to recognise the positive social impacts being made in communities across the island of Ireland. I would like to take this opportunity to commend all the communities involved for their spirit of collaboration and camaraderie in making it to the finals. It is also important to recognise the role of local authorities across the island of Ireland who work closely with their communities to support inspiring voluntary initiatives. These awards serve as one of the important ways that we can recognise those involved in working to make a difference in society". Cathaoirleach Cllr. Gerry McMonagle said "I am delighted that Donegal has been chosen to host of this prestigious awards ceremony and that we welcomed over 800 people to celebrate and recognise the wonderful contribution that community groups make to life in their own local areas all across the island of Ireland. This has been a great opportunity to showcase what Donegal has to offer and I hope all our visitors have had a wonderful experience and that they bring home with them fond memories of their trip to Donegal". A group of 15 people involved in the Kerry Social Farming Project met with staff from Donegal LDC on 2nd December in Letterkenny. The Kerry Social Farming group were in Donegal for the Pride of Place Awards. In attendance from Kerry Social Farming were host farmers (Ger, Mary Anne and Tim o Sullivan, Dessy Cronin (also a parent), George Kelly, Christy and Mary McDonnell), participants (Martin Sheehan, Earl Leahy, Brendan O Sullivan, Mags O' Donoghue), working group members (Kevin Griffin (SKDP), Angie Smith (SJOG), Julie Brosnan (SKDP, Kerry Social Farming Administrative Support and Helena Switzer (Kerry County Council/SICAP)), and the KSF facilitator Irene Kavanagh. In attendance from Donegal LDC was CEO Padraic Fingleton, along with RSS/Tus/SICAP managers and supervisors. Councillor Ian McGarvey a member of the Board of Donegal Local Development Company was also present Following a presentation made to the group on the Kerry Social Farming Project and how SKDP developed the project, there was a very positive informal Q&A and discussion session on various aspects of the KSFP and how to implement same in Donegal. 1. The Kerry Social Farming Project: under the Category "Community Reaching Out Initiative". The Kerry Social Farming Project provides people with disabilities (participants) the opportunity to engage with ordinary farm families and the farming community in meeting their personal life choices, thus promoting social inclusion and improved quality of life. The project operates as a voluntary model, whereby host farmers offer their time freely to enable participants engage in their farming activities and thus the wider rural community. Farmers are the heart and soul of rural Ireland and are very well placed to support inclusion of marginalised individuals in the rural community. This voluntary model has been highly successful to date and is crucial for the sustainable development of the project and important for developing real relationships. All the host farmers are enthusiastic about and deeply committed to the project, citing it as a wholly rewarding experience for them as they in turn become more engaged in their community. 2. The Glenbeigh Community Council under the Population Category 0 - 300 Glenbeigh is cosily tucked into the surrounding horseshoe of hills. The Caragh and Behy Rivers flow at either side of the village into Castlemaine Harbour. Beautiful blue flag Rossbeigh Beach boasts six miles of sand. Community spirit is palpable as evidenced by the work of Tidy Towns, walkway development, sporting achievements and responses to challenges posed by coastal erosion and rural decline. This community appreciates the natural environment and is building on this asset. The community has developed enviable sporting infrastructure including a football pitch and a community hall. Local activities include walking, fishing, surfing, kayaking and horse trekking on Rossbeigh Beach. A recent achievement includes Glenbeigh-Glencar's memorable AIB All-Ireland junior club football championship final success at Croke Park. However it is the hospitality and friendliness of the people that matters most and the manner in which the community takes care of those who live in and visit this lovely place. Volunteers in each of the communities have been busy planning and preparing for the visits. Staff members of Kerry County Council's Community and Enterprise Department have been meeting with the groups to advise on the adjudication process and to generally assist where possible. The Kerry County Council's Local Area offices have also been very supportive of the event working together with the Local Development Companies. The judges spent between two and half-hours and three hours with each project during which the group was required to make a 20 minutes formal presentation, and undergo a question and answer session. In addition to ensuring that the areas are looking well, each community has been identifying their strengths and the projects that they are proud of and wish to show off to the judges. All projects are worthy entrants and the judges were very impressed on the day. 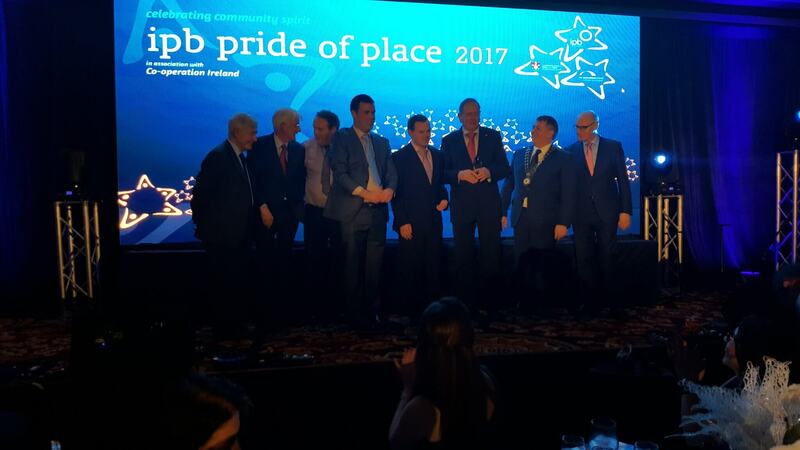 The IPB Pride of Place 2017 winners will be announced at the Awards Ceremony in Co Donegal in December 2017. A group of nine host farmers (Ger & Mary Anne O Sullivan, Patricia Kelliher, Dessy Cronin, George Kelly, Eamon Horgan, Breeda O Sullivan, Christy & Mary McDonnell), participant (David Cronin) from the Kerry Social Farming Project, along with Kerry Social Farming Facilitator Irene Kavanagh were invited to attend the Burren Winterage School 2017 in Ballyvaughan Co Clare by Dr Brendan Dunford (Burren Programme) and Brigid Barry (Burren Beo Trust). Irene Kavanagh gave a presentation on the Kerry Social Farming Project to the delegates on October 26th followed by host farmers answering questions on the project. The group from Kerry Social Farming attended the presentations on the 27th and attended the farming innovation fair and farm demonstration walk on Saturday 28th October 2017. The trip was a hugely successful knowledge transfer event with ample opportunity to discuss social farming and High Nature Value (HNV) Farming. The host farmers thoroughly enjoyed attending the Burren Winterage School and found it highly informative. Likewise the feedback from the delegates on the Kerry Social Farming Project was highly positive with a lot of interest shown in establishing social farming. Participants - Amy O Dea, Tim Heffernan, Mags O Donoghue, David Cronin, Brendan O Sullivan (with his father James), Claire Spillane (with her father John), Earl Leahy. Watch a clip of host farmer Ger O Sullivan getting his ‘brain hacked' by the infamous Keith Barry at the National Ploughing Championship 2017! 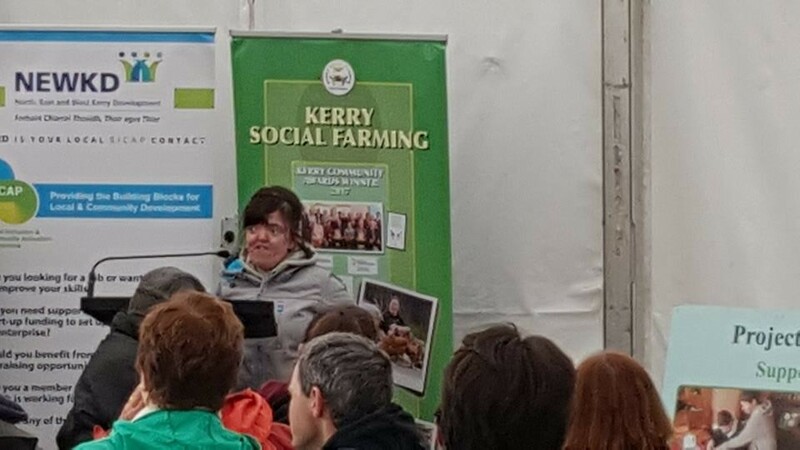 The Kerry Social Farming Project was well represented at the South Kerry Ploughing Championships in September 2017. There was a lot of interest from the farming community and members of the public in general. The event was an ideal opportunity for host farmers to promote the project and inform the farming community how social farming operates and what motivates them to get involved in the project. The launch of the Kerry Social Farming Evaluation Report took place on one of the Kerry Social Farming host farms in July 2017. There was a large turnout of almost 300 people who were representative of a whole cross section of the wider community. The purposes of the event was for Minister Creed, Minister for the Department of Agriculture Food and the Marine to officially launch the Kerry Social Evaluation Report and to present the key findings of the report to the Minister and the wider farming, statutory, public representative, research, educational, and social care communities, along with persons with disabilities and their families and the general public as a whole. Thus, the launch was geared toward raising awareness, particularly of the benefits and the success of KSF, driven by bottom up community collaborative spirit; highlighting the issues relating to the requirement for the long term investment into KSF going forward; and to provide a platform to present the research based findings of the KSF project, the multitude of benefits from the project along with key recommendations. Above all it provided guests with the opportunity to meet those who are at the heart of the project, the host farmers and the participants and to experience what the project is about from them in their own words. The day involved guests arriving and meeting and greeting on the farm, and going on an extended host farm walk around the farm. The positive atmosphere was enhanced by a large marquee on the farm to accommodate guests, refreshments, a buffet lunch for all, and a local family, the local musical family, the Kellihers entertained guests with traditional music on the day. The host farm walk consisted of different stations, 6 in total: host farmers and farm families, participants, families of participants, partner service providers and support workers, mixed group (host farmers, participants, families, support workers) and SoFI also had an information stand on site to inform guests about the national social farming project SoFI. Information boards marked the host farm walk so as to further illustrate KSF to the guests. The large 4x4, colourful information boards consisted of providing general background information about KSF and social farming in general, as well as quotes taken from the interview transcripts that were included in the KSF Evaluation Report, consisting of quotes from host farmers, participants, families and support staff, placed at the respective stations (see Appendix 16 for an example of one of the boards, which is a large welcome information board that was placed at the entrance to the farm near the road, along with a large Pride of Place sign, so as to inform arriving guests of the farm location). The KSF host farm walk signs were placed at the entrance to the farm and the farm yard (Appendix 1b). The host farm walk at the launch day gave guests the opportunity to get a real understanding about the project. Minister Creed, DAFM, also was taken on the host farm walk, along with Sean Kelly MEP who were accompanied by George Kelly (KSF Working Group Chairperson), Noel Spillane (SKDP CEO), Joseph McCrohan (Rural Development Manager SKDP). Minister Creed took great time to talk to farmers, participants, families and support workers to learn more about the project. As well as all those directly involved in KSF, host farmers, participants and working group members, there was a great turnout of families, and partner agency personnel, along with many service users interested in undertaking social farming. Rural Social Scheme staff (supervisors and participants) from SKDP were vital to ensure the smooth running on the day, from manning the registration, to the car park, to guiding guests on the host farm walks. The cross section of guests included Kerry Local Community Development Committee representatives, Kerry County Council representatives, along with TDs, and Kerry County Council elected members. Representatives from businesses such as Community Finance Ireland, the Kerry Group and FEXCO and the IFA were also in attendance, along with the Department of Social Protection and the HSE. Farmers who were interested in social farming were also present. A bus, supported by Local Link Kerry, transported interested farmers from North Kerry/Listowel area (organised by Dave Fitzgibbon NEWKD and KSF Working Group member) along with SJOG service users, their families and staff. 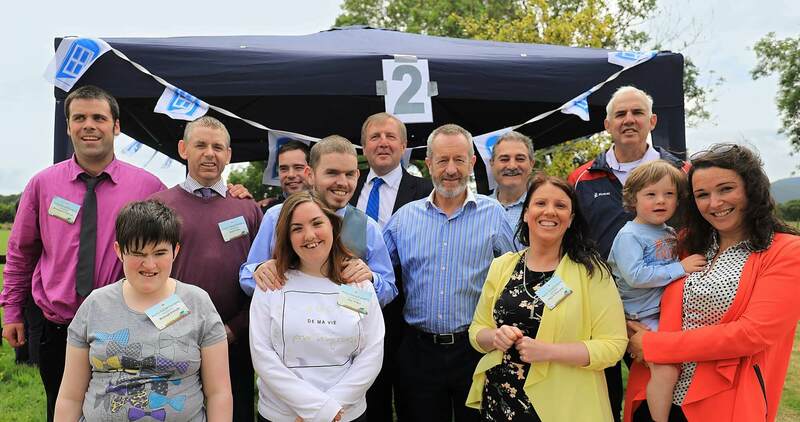 Agencies that are not currently a member of KSF Shared Services came on the day with interested service users: Cope, An Cuan, National Learning Network, Rehab Care, and Kerry Mental Health. Educational representatives were also present on the day from Kerry Education Training Board, Mary Immaculate College, University College Cork and Limerick Institute of Technology. Representatives of other Local Developments and Social Farming Ireland were also present. The presentations were given by Gloria O Driscoll (Chairperson of SKDP), who highlighted the involvement of SKDP and the governance of Kerry Social Farming. Following a welcome address by Chairperson and host farmer George Kelly, Joseph McCrohan, who has been involved in the Kerry Social Farming Project since the beginning, outlined the establishment and development of the project. Dr Brendan O Keeffe gave a presentation on the evaluation of Kerry Social Farming, highlighting that Kerry Social Farming "…offers people with disabilities greater choice and greater options and opportunities for progression and self-actualisation. It does so in meaningful and constructive way'. Additional speeches were made by Pat Spillane (Ambassador for the Action Plan for Rural Ireland, who also wrote a Foreword for the report) and MEP Sean Kelly. Various representatives of social farming, gave their input regarding their involvement with the project: Ger O Sullivan (host farmer), Earl Leahy (participant), John Spillane (parent) and Domonic Kiely (support worker, St John of God Kerry Services) The moving video on Kerry Social Farming which was filmed on Eamonn Horgan's farm (see link here: https://www.youtube.com/watch?v=voB4gAjQuLs&t=259s) was also shown to Minister Creed and the wider audience and was very well received. Eamon Horgan (host farmer), Mags O' Donoghue (Participant) and Tim Heffernan (Participant) had the opportunity to reflect on how important social farming is to them. Minister Creed, Minister for the Department of Agriculture Food and the Marine, gave the final speech. The Minister stated that he was very pleased to be at the launch because real inclusion is about action rather than words and that Kerry Social Farming and SKDP are more about actions than words. Minister Creed said it was a humbling experience to walk through the farm and meet all those involved who make it happen, including the participants and host farmers and that it's a fantastic example of collaboration. He also stated that the findings from KSF Evaluation Report will help inform social farming in Kerry and nationally. Overall, the feedback on the day was highly positive and a lot of effort over several months was put into making it the success that it was. Videos of the day (highlights and ‘complete version' with all speeches) are on YouTube, which can be accessed here. Two key messages from the launch and Kerry Social Farming Evaluation Report are that social farming works and that the Kerry Social Farming Project requires more long term sustainable funding. South Kerry Development Partnership CLG distributed a press release to all mainstream local/nation press and media, following the launch of the report. Further coverage of the launch can be accessed here & here. Preparations for the Launch of the Kerry Social Farming Evaluation Report and Visit by Minister Michael Creed, Minister for the Department of Agriculture Food and the Marine. The big day took many months of preparation and planning. The collaborative strength of the Kerry Social Farming Working Group, host farmers, participants, families, the SKDP Rural Social Scheme staff, which epitomises Kerry Social Farming and Rural Vibrancy, came to the fore in getting ready for the event. A farm meitheal on Hazelfort Farm ensured the farm was prepared for the event. This meithael comprised of two of our host farmers Eamon Horgan and Ger O Sullivan, with their participants, who put great effort on the farm in order to ensure it was ready for the event and to help upgrade the farm in terms of health and safety and making the area suitable for the host farm walks. The SKDP RSS supervisors, participants and Tus participants also helped get the farm area ready. Concrete was laid in the farm yard, not just for the purposes of the launch but was also recommended following a farm safety audit, for ease of access and safety of farm participants. Likewise a sliding door replaced a swinging door for participant safety. The agency support staff and participants, also put great work in getting the registration area ready, and in setting up the host farm walk stations. Video of the Kerry Social Farming Project winning the Kerry Community Awards 2017. (1)	A wonderful mini-documentary about one of our host farms, Eamonn Horgan's farm in Kilgarvan, and the participants who go there. (2)	Highlights of the launch of the KSF Evaluation Report July 7th 2017, Minister Michael Creed, Minister for Agriculture Food and the Marine in attendance. (3)	Full film of the launch of the KSF Evaluation Report July 7th 2017, with presentations/speeches, including speech on the findings of the KSF Evaluation Report, 2017 by Dr Brendan O Keefe (Mary Immaculate College) and Minister Michael Creed, Minister for Agriculture Food and the Marine.